Klingon Commander Kurn (Tony Todd) comes on board as first officer as part of an exchange program. Kurn bullies everyone but Worf — an affront to our favorite Klingon — and eventually reveals that he was testing his long-lost older brother. 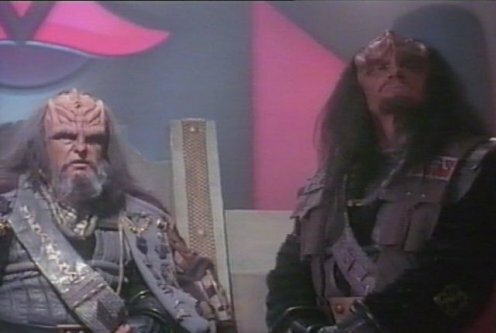 Turns out Kurn was on the Klingon homeworld when Worf was orphaned at the Khitomer outpost, but Kurn’s real identity is not publicly known. He tells Worf that the Klingon High Council is planning to blame their father, Mogh (who died at Khitomer) for conspiring with Romulans in the attack. Picard takes the Enterprise to the homeworld to let Worf challenge the ruling. Turns out Duras (Patrick Massett) the son of Worf’s father’s greatest enemy is leading the charge, the result of some new-found intelligence. The Enterprise investigates and determines that Duras’s father was actually to blame — and Mogh was blamed publicly to preserve the empire (Duras has a powerful family). When pressed with the evidence by Picard and Worf, Klingon leader K’mpec (Charles Cooper) won’t let the truth come out, for fear that it would cause civil war. 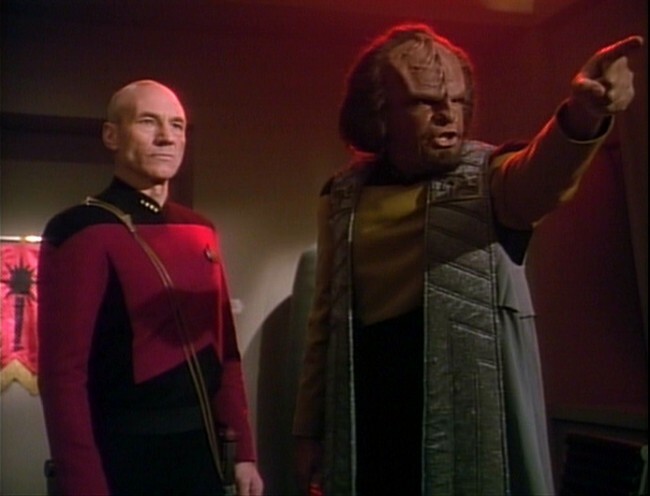 Worf, in a selfless move, accepts discommendation, which makes it look like he accepts his father’s guilt. He’s allowed to live, but only as an outcast among his people. Although “A Matter of Honor”, “Heart of Glory” and “The Emissary” showed us a lot of TNG-era Klingons, “Sins of the Father” is the first time we see the Klingon homeworld and how the empire is governed. It’s important from an atmospheric standpoint and a cultural one. The Klingons are ruled by a bunch of high-ranking warriors, who have no real problem doing dishonorable things, despite the pretense of honor. That’s something that comes back into play a lot over the next decade of Trek. The attitude of some Klingons toward their Federation allies shows up here, too. Duras notes that the Starfleet officers wear a “child’s uniform” a description other Klingons make over the years. 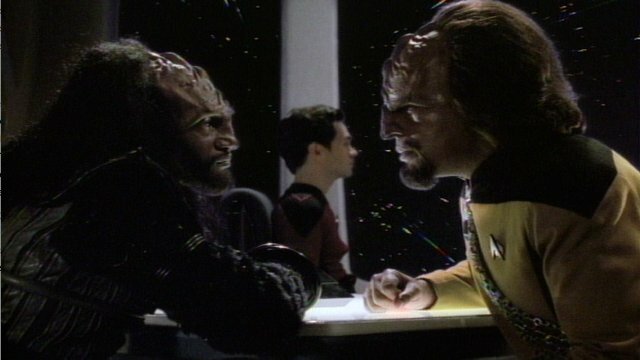 And, of course, the events revolving around Worf’s family continue to have ramifications throughout TNG and into DS9. It’s too long a list to get into here, but we’ll discuss in later reviews. K’mpec and Duras — two guys who could really use a box of Tribbles. Kurn’s pig-headedness with the Enterprise crew is a bit much. It’s used to advance the story, but it’s hard to figure why he acted that way — other than to fill the show’s first 10 minutes. By the third season of TNG, we already knew Klingons were different. That said, I did love the dinner scene and Kurn’s reaction to human food. There’s also the issue of just how connected Worf is with the empire. At this point in TNG, he seems like an outsider, though one who knows a lot about Klingon culture and whose standing isn’t problematic. He doesn’t know, for instance, that his father is being accused of crimes that would dishonor his family until Kurn tells him. In fact, that’s one of the reasons the High Council chose to blame Mogh — because it wouldn’t really affect Worf. But in later episodes, Worf is much more involved with his house, which apparently is one with great standing (and has noble bloodlines). We’ll discuss this further, as well — though the schism is most noticeable when Worf becomes a regular on DS9. Lastly, the creators clearly hadn’t figured out what to call the Klingon homeworld. Picard actually tells Wesley to “set course for the first city of the Klingon Imperial Empire.” That might be the clunkiest line of dialog in all of TNG. I guess we should be glad they didn’t call the planet “Kling” (see “Heart of Glory”). This is a strong episode that really sets a lot in motion for the next 10 years. But there’s too much Klingon bellowing, especially in the show’s middle acts. Tony Todd is actually great as Kurn, though he’s better in later episodes. The first scene in the council chambers (listen to Michael Dorn say “faaaaaaatherrrr”) is a bit much. Of course, this episode sets the course for Picard’s involvement in Klingon affairs, as we’ll discuss in later reviews.